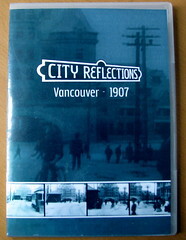 It has been over a year since John and I received a preview copy of the 1907 trolley car footage of Vancouver on DVD. 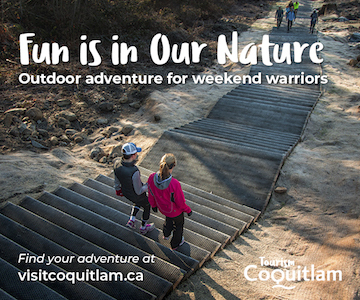 The film is the earliest footage of Vancouver and was shot with a hand-crank camera mounted on the front of a B.C. Electric Railway streetcar by William Harbeck of Seattle. 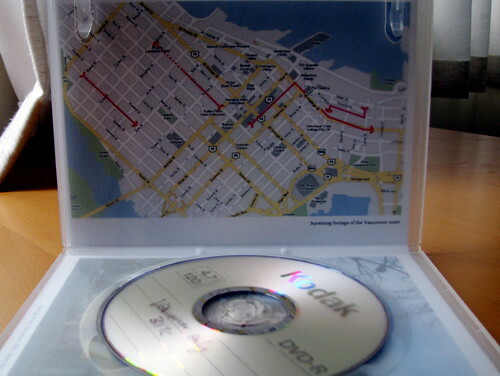 Included in the DVD liner was a Google map outlining the route the trolley took through Gastown and over to the West End. 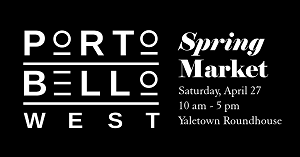 Over the last few years the Vancouver Historical Society has recreated the route shown in the film and now 101 years later it will be screened for the public and available for sale on DVD. More Info: There are no tickets to the screening, it’s first come first serve. 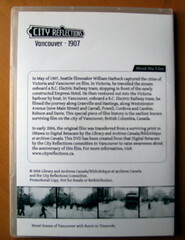 The DVD of 1907 – 2007 footage will be on sale for $20. View photos from the launch May 7th, 2008. In the original film you can only spot one car and the city is bustling with people, bicycles, and some horse-drawn carriages trotting along the dirt-covered Cordova Street. Here are some other events of historical significance that took place in 1907, courtesy of VancouverHistory.ca and soon available in the book, The History of Metropolitan Vancouver. 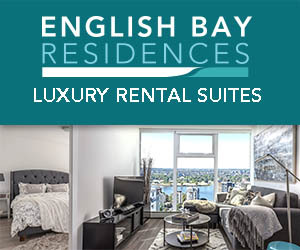 …The Montreal-based jeweler, Henry Birks & Sons, came to Vancouver in February of  and bought the well-established shop of George Trorey, at the northeast corner of Granville and Hastings. They kept Trorey on as managerâ€”and they kept his famous sidewalk clock, too. The Birks clock and the store can just be glimpsed as our movie-streetcar swings east onto Hastings from Granville. …David Spencer, who had earlier (1873) started a store in Victoria, put his son Chris, 38, in charge of a big new Spencerâ€™s on Hastings Street in Vancouver. Chris had started working for the Victoria store in 1882 at age 13. The new store was so successful that it eventually took up almost an entire city block. Today, the building is SFUâ€™s downtown campus. 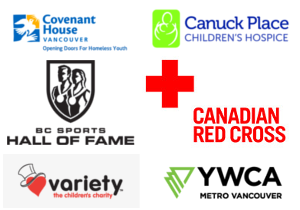 …A fellow named Richard Cormon Purdy opened a shop on Robson Street and began selling chocolates. The electric trolley in Vancouver has had a sordid history, from the Interurban to the recent retirement of the old electric Flyer buses. Although this city has had a love/hate relationship with transit over the years, more than anything this film proves that it can provide valuable glimpse into Vancouver’s past. Thanks for this entry, Rebecca! The first field trip I ever went to when I did my MBA was precisely to Purdy’s Chocolate Factory. It didn’t even occur to me to ask what the history behind it was. Vancouver is one of a handful of cities that held on to trolleybuses – most got rid of them in the great wave of automobility of the fifties and sixties in the name of “greater flexibility”. The decision to retain electric vehicles is now seen to be far sighted as diesel costs can only rise. Edmonton is the only other Canadian city with electric trolley buses, Toronto the last hold out of the streetcar. But both are making a comeback around the world as peak oil hits. Seattle also has trolleys, it’s worth noting. People from cities that lack them find them very cool when they visit. But I am officially rather old now. The electric Flyer buses, introduced in the ’80s, still feel like the “new” trolleys to me. 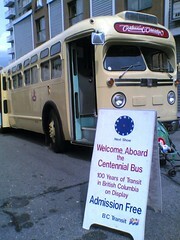 I grew up with, and went to high school on, the original losengey white Brill trolley buses as in DaveO’s photo above. Those of you who rode them will remember the manual-roll route signs and round interior lights that would dim or flash off and on when the trolley arms bumped across joints in the wires. I also grew up riding the Brill buses. I have the front destination sign that was rescued from a scrapyard that is still awaiting mounting in a suitable place. I recall there were some Brills with a completely green interior and as a kid they difference made them my favourite buses. The Brill buses were pretty rickety by the late 70’s, going down the hill on Dunbar from 27th or so all the way to 41st was a clattering experience. Remember the gate to open the back doors? Or the seats that had some form of tool kit built underneath?